Dubai, UAE, May 10, 2017: The urban romanticism and eclecticism that Creative Director Alessandro Michele has infused into his collections has redefined Gucci’s codes and creativity. His distinctive and contemporary aesthetic favors gender fluidity, rich embellishments, and an unconventional vibe, all blended liberally and unexpectedly. As seen on the runway, eyewear is part of the House’s new aesthetic. Over 250 new styles developed annually feature the brand’s iconic motifs alongside novelty details, making the offering extremely versatile for the contemporary tastemaker. 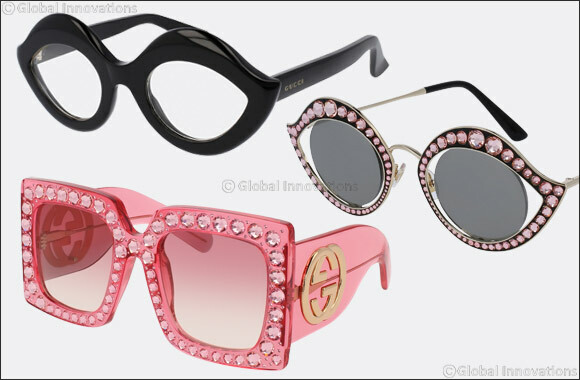 These special edition women’s sunglasses feature an exclusive and cutting- edge handmade chevron treatment whose uniqueness is further elevated by three iconic symbols – the GG logo, the stud and the tiger.